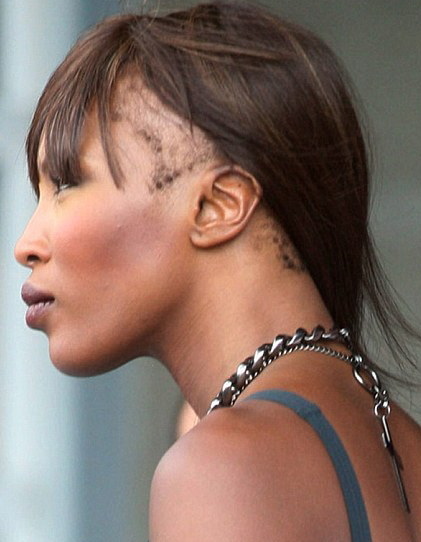 Naomi Campbell seriously needs to back away from the hair weaves. I suspect she already has, seems as though she has no hair to attach a weave to, and this is clearly a wig, but christ! Has Naomi ever worn her hair natural? I don't recall seeing any pictures of it. She'd look stunning with a curly fro. I wish she'd try it. It would be more modern too. That's assuming she can actually grow her hair anymore – those broken off wisps don't look too promising to me. Perhaps she feels pressure in the fashion industry to conform to a 'westernised mode of beauty'. Maybe she just likes long, straight hair. On another note, will this woman ever age?! Not a jowl in sight and a body like a finely honed racehorse at 40 years old. Her mother still looks amazing too so she's all set. She just needs to get growing those little curly tendrils into a gorgeous natural style. How about going bald for some time? I think her face is suitable for that (not everyone's is) and she will still look beautiful, with the right make up & such.